Chloroplasts play central roles in the integration of temperature-, light- and redox-induced signals on the molecular level which is essential for acclimation processes. Imbalanced photosynthetic activities upon temperature and light changes require adjustment of the relative abundance of photosynthetic complexes and co-ordinate regulation of post-transcriptional events by fine-tuning expression of plastid genes. 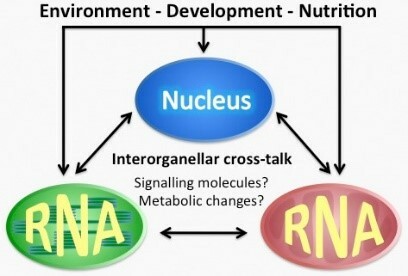 For instance, endonucleolytic cleavage within intergenic regions can be a prerequisite for regulation of subsequent translation and the stability of individual mRNAs. A surprisingly large number of nuclear genes, which is several-fold higher than the number of plastid genes, is involved in the regulation of the plastid RNA metabolism. We have identified several newly evolved, nuclear encoded RNA-binding proteins required for processing, stabilisation and splicing of specific plastid or mitochondrial RNAs. It appears, that divergence of organellar UTRs provide new platforms at the RNA extremities for RNA-binding factors to implement molecular processes in response to environmental stimuli.